Size is 18"x 32" including a 2" white border. Regarded as the one of the best of the “bush planes,” the de Havilland Canada DHC-2 Beaver is a single engine, high-wing, propeller-driven, STOL aircraft developed by de Havilland Canada for flight operations in remote and rugged areas of the world. Its outstanding short takeoff and landing capabilities make it ideal for hauling cargo and passengers into and out of wilderness areas usually only accessible by foot or canoe. Enhancing the planes utility, the design can easily be fitted with wheels, skis or floats. The first flight of the DHC-2 occurred in 1947 and by 1967 when production ended, 1,657 had been built and hundreds of them are still flying today. The Beaver was also used by many armed forces as a utility aircraft including the U.S. Army. 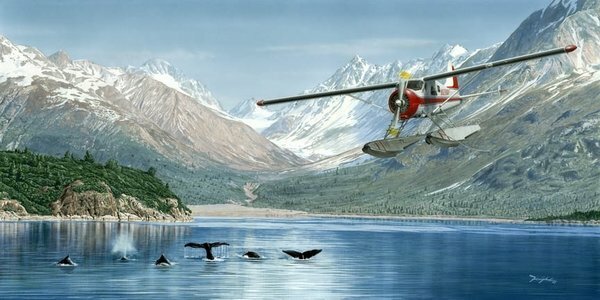 This image depicts a Beaver float plane on an Alaskan sightseeing excursion gathering some exciting stories to be told when the passengers are back at home.